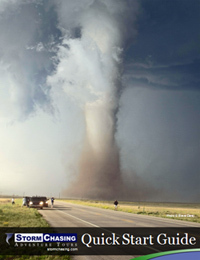 A collection of informative links dedicated to enhancing awareness and knowledge of severe weather and storm chasing. Our informative Quick Start Guide will help you gain an understanding of severe weather and storm chasing before you even begin a storm chasing tour! Since the amount of science and technology that goes into storm chasing can be overwhelming, we created this easy-to-read guide to aid in your understanding of severe weather during your storm chasing tour. We encourage you to ask as many questions as you like during our tours, so hopefully this guide will help to increase your curiosity! This guide is compatible with the iBooks app on the iPhone, iPad, and iPod touch along with many eBook reader devices that support the PDF format. Weather data sources, severe weather forecasts, and more.